When a huge flood devastated Cedar Rapids, Iowa, in 2008 the community was faced with a host of problems more commonly seen in big cities, like homelessness. But in the midst of this tragedy the residents began to see an opportunity to rethink how they would rebuild the core institutions of the town. The local newspaper, owned by the Gazette Co., wanted to be part of rebuilding the community. As part of a series on reimagining Cedar Rapids, the company tapped Cornally -- a high school STEM teacher whose subjects have included calculus, physics and computer science -- to spearhead an effort called “The Return to School Project.” Over 100 adults strapped on backpacks and went back to school -- walking in the shoes of students. They were asked to report back on what they noticed about the experience. “They said stuff like, ‘Man, teachers work their butts off and it’s kind of like no one in the building cares, even other teachers,’” said Cornally. They also noticed that students spent a lot of time transitioning, and they talked only about grades, never about what they were learning. But the adults noticed a lot of positives as well. They said it was clear school was a second home to kids and played an important support role for many of them. Cornally wrote an article about these observations that ended with a call for Cedar Rapids to consider a school without grades or classes as part of its effort to rebuild. Rather than using standardized tests to measure learning, students would be held accountable by community partners with whom they would work on projects. That article sparked a small experiment at the community college, with just 12 students and one half-time teacher. Over the next 10 years it grew into Iowa BIG, an alternative education offering that now has two sites, 240 students, eight teachers and a huge network of community partners. They even recently won one of the smaller XQ Super School grants for innovative school models. Cornally said students interested in attending BIG often come in two types: super-high achievers looking for something interesting for their résumé, and kids for whom traditional school does not work. “They come to us because we don’t control their time, just their output,” Cornally said. Iowa BIG is far from a traditional school, but it is public. According to Cornally, Cedar Rapids doesn’t have private or charter schools almost as a matter of tradition. All kids attend public school, so those schools are well-funded, strong academic institutions. Generations of Cedar Rapids-area families attend the same high schools and there is a lot of pride and identity around them. But the big, comprehensive high school with bells, AP classes and more traditional teaching styles doesn’t suit all learners. That’s where Iowa BIG comes into the picture. It’s a partnership between the three school districts in the Cedar Rapids area. Students can take classes at Iowa BIG, but they graduate from their home schools and often split time between the two institutions. All three districts contribute full-time employees to BIG, and all get to claim the program as part of what they offer. This arrangement can be both great and hard for students. On the one hand, they have access to different kinds of opportunities at BIG, but some have to travel long distances between schools. BIG classes are focused around big projects that students care about. Cornally calls them “Saturday projects,” something the student would want to be working on over the weekend, but gets to do for school instead. The projects almost always include an outside partner with whom students collaborate. That real-world home for the product helps make students accountable for their work and to their collaborators. Cornally said this approach to collaborative projects is more palatable to students who have rebelled against traditional homework. Despite all that, the courses that appear on student transcripts sound standard. “We have a custom-built software system that tracks each kid against the state standards they're responsible for,” Cornally said. While the classes don’t look like traditional English or chemistry classes, the teachers are aware of the standards they need to hit. They try hard to build those standards into the project in interdisciplinary ways, but when they can’t they are honest about it with the students. “That honesty is worth a million dollars to a teenager,” Cornally said. Because students come from different schools, are on different schedules and live far apart, most don’t come to the BIG building every day. Students communicate with each other and with teachers through Slack and schedule times to meet up only when necessary. Kellen Ochs likes BIG because the adults there respect his time. He likes science and thought he wanted to be a chemist until he started taking chemistry classes at his traditional high school. He learned about BIG from a friend who is a year older. Kellen was a disenchanted freshman enviously watching his sophomore friend leave to go to BIG nearly every day. One of Kellen’s favorite projects at BIG is building a biodiesel engine. He and his group have been teaching themselves about how motors work and working out the chemistry to convert used cooking oil into something combustible. He said his group made a batch of oil but didn’t get it hot enough, so only some combusted. It’s all about adding the right amount of ethyl alcohol and other reactants, Kellen explained. He’s been using a lot of YouTube videos and online materials to teach himself the inorganic chemistry he needs, and his group has taught each other a lot through trial and error. The group meets once a week for an hour and half to check in on progress and divvy up new tasks, but Kellen says the amount of work he puts in varies from week to week. Sometimes he spends hours on it, and other times his part doesn’t take that long. He likes that he’s learning how to manage his time and that his group trusts him to complete his tasks. Kellen is also taking English literature at BIG, a class he was originally less enthused about, but has found surprisingly enjoyable. “I thought I was going to be really bored because we did poetry in the ninth grade and it was horrible and I hated it,” Kellen said. But at BIG the poems feel more relevant -- they’ve been reading poems about the African-American experience in America. “They are living in my reality whereas when you read Shakespeare I could swear he was living in a different reality,” Kellen said. He stopped and looked up some of the names of the poets he’d enjoyed: Natasha Trethewey, Gregory Pardlo, Claudia Rankine. But Kellen’s passion project at BIG is pool alarms. The project idea came from a local professor whose nephew drowned when his parents lost sight of him for just a moment. The pool alarm didn’t go off. Now Kellen and his friend are trying to build a better pool alarm, one that can’t fail when it’s needed. BIG finds projects in three main ways: businesses or organizations come asking to collaborate, teachers develop projects and find partners interested in collaborating, and students initiate projects. “The kids’ ideas are just as good as the adults' ideas,” Cornally said. “We are excited when a kid has an idea because half the time they’re good and half the time they’re bad, but it’s the same as the adults.” No matter how the project comes to them, Cornally said teachers work to think it through, flesh it out and make sure it’s a viable project. If it is, it gets added to a custom-built database that students can browse when they shop for projects at the start of the semester. “We live in that universe of just below your resource line, but well above flippant,” Cornally said. In other words, many businesses come to BIG with projects that would help operations, but aren’t mission critical. That’s a perfect space for high school students to bring their enthusiasm, creativity and energy. For example, the United States Geological Survey wanted to create an app to streamline the process when citizen scientists send in fossils. That’s an app the agency probably wouldn’t spend limited resources on, but they’re excited to have it if a student can build it. As students work on their projects they get support from teachers, who also ensure that students are meeting the state standards required for the course. Teachers meet in a daily “scrum” where they talk about projects, individual students, who needs more support, who is avoiding all the math in the project, and who on staff would be most effective at reaching out. While the projects may not neatly fit the criteria colleges expect to see, students often discover passions they want to pursue in college through the projects they do at BIG. Bailey Swartzendruber is a good student at her traditional high school, but began taking BIG classes her senior year because she wanted to use her learning to take more of a leadership role in the community. She’s headed to the University of Iowa for college and plans to major in International Business with a minor in human rights. “BIG really opened that up for me,” Swartzendruber said. She came into BIG with vague goals of wanting to do something positive for the community that connected to business. She and her adviser started talking about the refugee crisis, which soon became a project writing social studies curriculum around refugee issues. Swartzendruber is excited that her work could soon be used by students around the world. “Living in the Midwest, living in Iowa, I just never thought I would get this opportunity,” she said. Swartzendruber also took statistics at BIG, an experience that left her with conflicting emotions. She found the open-ended, self-directed approach to math difficult. She had weekly seminars on the content and then was asked to apply it to her refugee project. For example, her teacher gave her data on the location and number of displaced persons and asked her to use coding software to analyze it. She felt overwhelmed by the task. “At first I kind of gave up on it and didn’t turn any of my stuff in, which is so not me,” Swartzendruber said. She didn’t feel she had fully grasped the concepts before she was being asked to apply them to a situation where she also didn’t know how to use the coding software. It felt uncomfortable to learn by doing, rather than through rote practice. With hindsight, she can see that learning in a new way was uncomfortable, but that she gained valuable skills she’ll be able to use in the future. She looked at the college coursework she’ll be tackling next year and immediately noticed one class requires the same coding software she now knows how to use. Ultimately, Swartzendruber is aware that, despite being a good student coming into BIG, she didn’t have a lot of the practical skills required for work. She was terrified to email her partner organization, didn’t know how to manage her time when she wasn’t being told exactly what to do, and had little experience disagreeing with collaborators. These are all skills she knows she has improved while at BIG. They are also skills her teachers explicitly monitor and work to improve in students. “I feel like at my regular high school I’m just going through the motions. I felt it wasn’t pushing my boundaries,” Swartzendruber said. Now, when she goes into the BIG building, she’s inspired by the work of her fellow students. One girl designed a fashion line, coordinated a fashion show, and took it on the road with real models. Another is interviewing faith groups to find out how welcoming they are to people with alternative lifestyles. That’s one of the most important things to Cornally. He was a successful AP computer science teacher for years before helping to start Iowa BIG. He worked at a high-achieving high school, but when he ran into former students home on break from college and asked them what they learned in AP calculus that was useful in college, they rarely had an answer. It was a clarifying moment. “Why do I lose sleep over you?” Cornally asked himself. If students didn’t need what he taught them, and didn’t remember it either, why was he working so hard? “I’m just a baby sitter that talks about calculus,” he realized. That’s when he began a journey to transform education. At BIG he’s confident students remember the work they did and can point to how it impacted their development. At Iowa BIG the “rigor” comes from knowing his students really well. "As a district we've been looking for a personalized learning environment for a while," said Erik Anderson, principal of Prairie High School in the College Community School District outside Cedar Rapids. As the district works towards a 10-year plan that will include changes at all its sites, Anderson said Iowa BIG is offering interested students some of that personalization now. 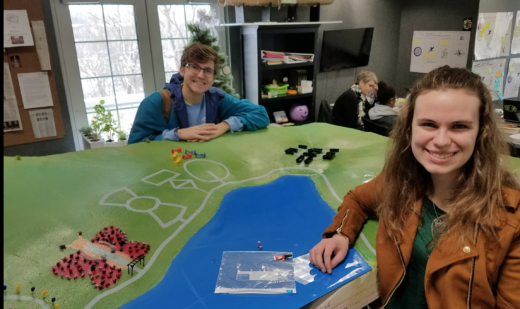 And, his teachers are learning from Iowa BIG, too -- some are trying to incorporate community-driven projects into their classes, while others are reimagining class as independent work time with teacher consultations available. "There's been flexibility required from everyone," Anderson said. He's proud of his staff for understanding that the goal is for students to have a good learning experience. And he sees the effect BIG is having on students in other small ways. "You can see these young people grow and mature at a different rate, especially in how they interact with adults," he said.